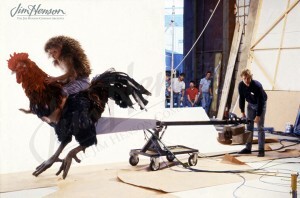 While shooting Labyrinth, Jim and his team began development on his award-winning series, The Storyteller. To provide source material for the writer Anthony Minghella, Jim and his producer Duncan Kenworthy hired several academics to scour libraries on both sides of the Atlantic for early versions of European folk tales. 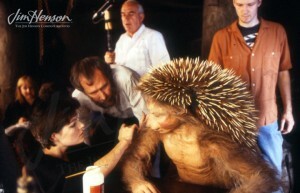 As 1986 began, with Labyrinth in post-production, the Creature Shop turned its attention to possible creatures for the proposed series and despite being fully engaged in the final edits on his film and early screenings and promotion, Jim arranged to shoot a test for the television series that March. Over the first half of the year, Minghella wrote three drafts of the pilot script, first calling it “The Hogboy,” then “The Grovelhog,” and finally “Hans My Hedgehog.” The production team began pre-production, working out budgets. Labyrinth opened at the end of June, and after a couple weeks of promotion, Jim and his children Cheryl and John took a three week vacation, traveling through Egypt, Thailand, Japan, Indonesia and Hong Kong. On August 26th, Jim and his director Steve Barron went into the studio to shoot “Hans My Hedgehog” with John Hurt in the title role and Jim’s son Brian performing his dog. Minghella’s script was derived from several versions of the story dredged up by the researchers. These included a Scottish version called “The Hedgehurst,” Grimm’s tale (originally in German) called “Hans My Hedgehog, ” and a Bohemian version. It aired in the US the following January 31st to great acclaim and was honored with an Emmy Award, a Gabriel Award, a Golden Hugo award, a People’s Choice award, an Ohio State Award, and the XII Resena Mundial de Acapulco Children’s Programming Award. The success made eight more episodes possible and they went into production the following summer. Learn more about The Storyteller. Jim on set during the shoot for The Storyteller: Hans My Hedgehog, 1986. Ailsa Berk as Hans in The Storyteller, 1986. 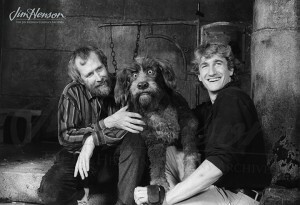 Jim and Brian Henson with the Storyteller’s dog. This entry was posted in 03-March '86, 1986, Storyteller and tagged Anthony Minghella, Brian Henson, Cheryl Henson, Creature Shop, Duncan Kenworthy, John Henson, Labyrinth, Steve Barron. Bookmark the permalink.